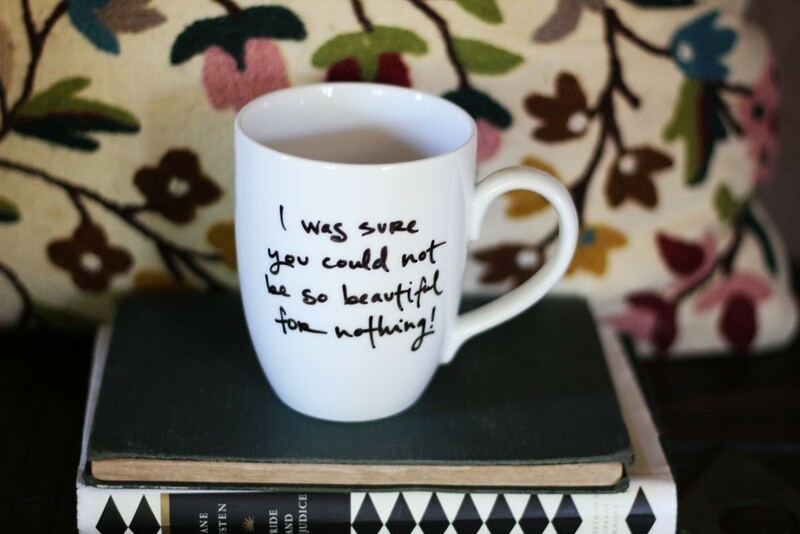 This Wednesday Wish is a combination of several of my favorite things: Pride and Prejudice, quotes, and cute coffee mugs. I love browsing Etsy for new finds, and this week was no disappointment. While searching for a coffee mug to take to work, I stumbled upon a fabulous shop: Brookish, a Jane Austen inspired shop. While I love several things in her shop, this mug made the top of my list. If you've read Pride and Prejudice, you'll recognize that this quote from Mrs. Bennet. In terms of comedy, nobody can make me laugh quite like the crazy Mrs. Bennet. I can't imagine anything more delightful than sipping a hot cup of tea, or maybe some sugary coffee, in a mug that states: "I was sure you could not be so beautiful for nothing!" I know, I know... you're so obsessed with it, too, aren't you?